Today is the last day of Hair Fair 2015, and as tradition dictates it is the day that we remove our hair to show we care. 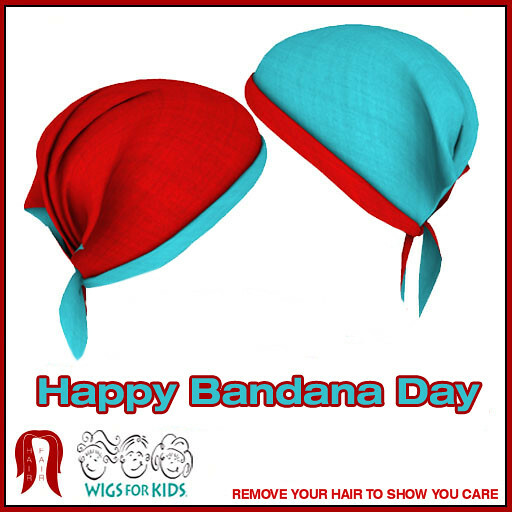 To support Bandana Day and Wigs for Kids, we have booths in every sim at Hair Fair selling for 50L the Bandanas created by Second Life Residents from all over SL. Each Bandana was created to help us help Wigs for Kids,and 100% of the money raised from their sale goes to the charity. They are sold MOD/Transfer so that you can buy for friends, swap with people, and no matter how big or small help us help them.